Mature trees are beautiful things, and often your dream garden is planned and built around them. But you have to be careful to protect them, especially their vulnerable root zone. Preventing the uptake of water, say, by laying concrete over the roots, is a sure-fire way to kill a tree. How can you protect your trees while still creating the beautiful landscape architecture you want? That’s where permeable paving comes in. With developers looking to use every square metre of space on Melbourne’s (often small) plots of land, unfortunately mature trees often end up next to the only place available for driveways to be installed. Planning regulations and landscape designers designate a “tree protection zone” around these areas, that need to have permeable paving. So no concrete there! Permeable paving in a tree protection zone (dotted line) on a landscape plan. Permeable paving landscape solutions like Pebble Pave can be used in tree protection zones to construct sections of driveways. 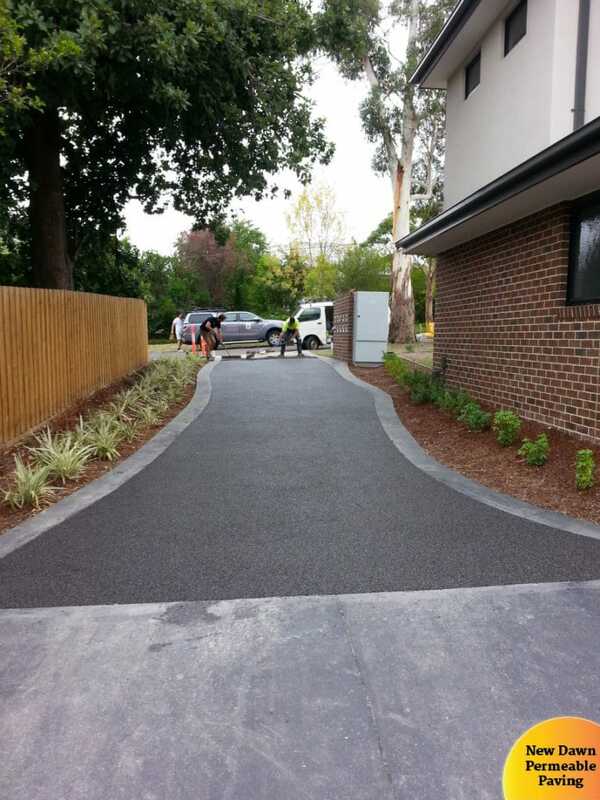 For driveways in a tree protection zone, a permeable concrete base is prepared prior to laying the paving. Then, Pebble Pave is installed on the permeable concrete. Aggregate colours can be chosen to match the existing concrete, or other landscape architecture features. Screeding and hand trowelling gives a beautiful finish, and the surface is ready for vehicle traffic after 72 hours. Permeable paving is a great solution for tree protection zones. Also, some councils have specific restrictions on the amount of non-porous paving such as concrete or pavers allowed on your property – for example, you may only be allowed to cover one third of your property with non-porous materials. By using permeable paving, you can still add hard surfaces, such as your dream outdoor entertainment area, without breaching these restrictions. Permeable paving in a tree protection zone. The best way to understand how and when permeable paving has to be used is to talk to us today. We can come out to your property and read your landscaping plan with you, as well as advise on how to best utilise permeable paving in your project. Or see more on our Facebook.